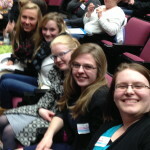 Nikki Hanson, Linnea Reuvers, Helena Johnson, Mariah Benn and Hanna Mahan attended the Winning Strategies Conference on March 28 at Normandale Community College. They heard presentations on anti-bullying, reading strategies and technology integration as well as other informative sessions. It was a great way to begin spring break!